parting shot "Parting Shot'' is a monthly opinion column written on a rotating basis by guest authors. The opinions expressed are not necessarily those of FE&S. 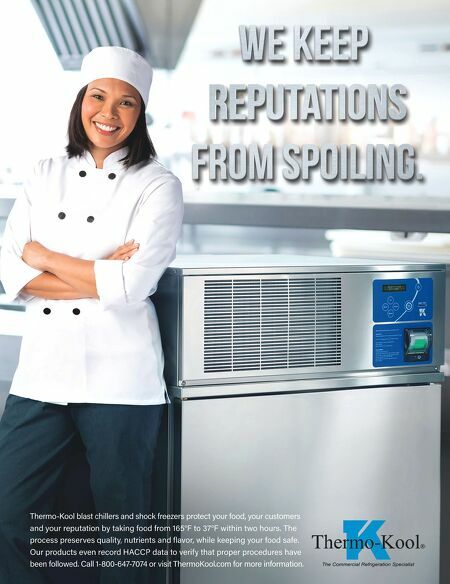 128 • FOODSERVICE EQUIPMENT & SUPPLIES • FEBRUARY 2019 Restaurant companies need to prepare for another possible recession — and one that could even be caused by delivery. 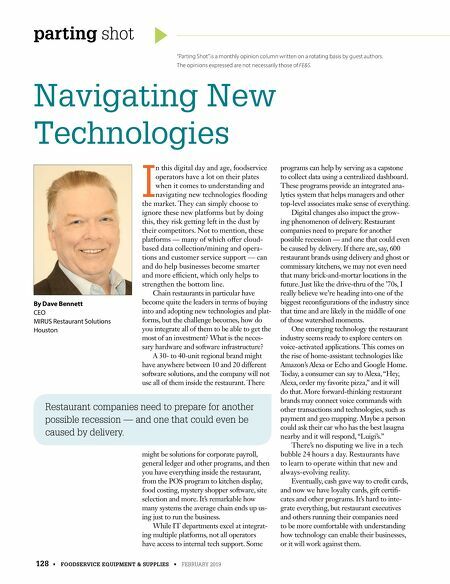 By Dave Bennett CEO MIRUS Restaurant Solutions Houston Navigating New Technologies I n this digital day and age, foodservice operators have a lot on their plates when it comes to understanding and navigating new technologies flooding the market. They can simply choose to ignore these new platforms but by doing this, they risk getting left in the dust by their competitors. Not to mention, these platforms — many of which offer cloud- based data collection/mining and opera- tions and customer service support — can and do help businesses become smarter and more efficient, which only helps to strengthen the bottom line. Chain restaurants in particular have become quite the leaders in terms of buying into and adopting new technologies and plat- forms, but the challenge becomes, how do you integrate all of them to be able to get the most of an investment? What is the neces- sary hardware and software infrastructure? A 30- to 40-unit regional brand might have anywhere between 10 and 20 different software solutions, and the company will not use all of them inside the restaurant. There might be solutions for corporate payroll, general ledger and other programs, and then you have everything inside the restaurant, from the POS program to kitchen display, food costing, mystery shopper software, site selection and more. It's remarkable how many systems the average chain ends up us- ing just to run the business. While IT departments excel at integrat- ing multiple platforms, not all operators have access to internal tech support. Some programs can help by serving as a capstone to collect data using a centralized dashboard. These programs provide an integrated ana- lytics system that helps managers and other top-level associates make sense of everything. Digital changes also impact the grow- ing phenomenon of delivery. Restaurant companies need to prepare for another possible recession — and one that could even be caused by delivery. If there are, say, 600 restaurant brands using delivery and ghost or commissary kitchens, we may not even need that many brick-and-mortar locations in the future. Just like the drive-thru of the '70s, I really believe we're heading into one of the biggest reconfigurations of the industry since that time and are likely in the middle of one of those watershed moments. One emerging technology the restaurant industry seems ready to explore centers on voice-activated applications. This comes on the rise of home-assistant technologies like Amazon's Alexa or Echo and Google Home. Today, a consumer can say to Alexa, "Hey, Alexa, order my favorite pizza," and it will do that. More forward-thinking restaurant brands may connect voice commands with other transactions and technologies, such as payment and geo mapping. Maybe a person could ask their car who has the best lasagna nearby and it will respond, "Luigi's." There's no disputing we live in a tech bubble 24 hours a day. Restaurants have to learn to operate within that new and always-evolving reality. Eventually, cash gave way to credit cards, and now we have loyalty cards, gift certifi- cates and other programs. It's hard to inte- grate everything, but restaurant executives and others running their companies need to be more comfortable with understanding how technology can enable their businesses, or it will work against them.